Comments have become a powerful force on the web. Every time I look at a new recipe or for that matter, something that I'm going to buy, I always read the comments. As writers, we are painfully aware of the comments people leave about our books. In recipeland, I find them very helpful. If a lot of people complain about the same thing (too dry, cooking time is too long, etc.) I know I have to pay attention to that, and I adjust the recipe accordingly. This recipe was inspired by Southern Living's showstopper Spice Cake with Cranberry Filling. Now that's what I call a presentation! White spice cake with a cranberry filling, and apple cider white frosting! And they made Christmas trees by frosting upside-down ice cream cones! Clever and gorgeous. But I wanted to make cupcakes so I made a few adjustments. First, I cut the recipe in half. There aren't too many comments, but a couple of them mentioned that the applesauce flavor is lost in the buttercream frosting. I can believe that. 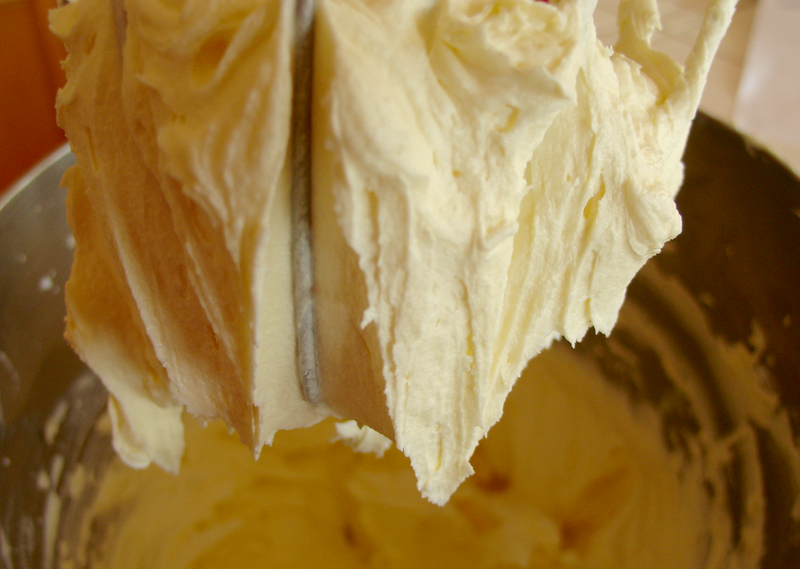 It takes some powerful flavoring to stand up to buttercream. So I put the apple cider in the cake recipe instead, and altered the spices to suit my preferences. I did follow the instructions for the cranberry filling, except I intentionally left out the orange juice. And for the frosting, I used tried and true plain old vanilla buttercream frosting. This recipe has three segments, but don't let that intimidate you. The cupcakes are very easy to make. 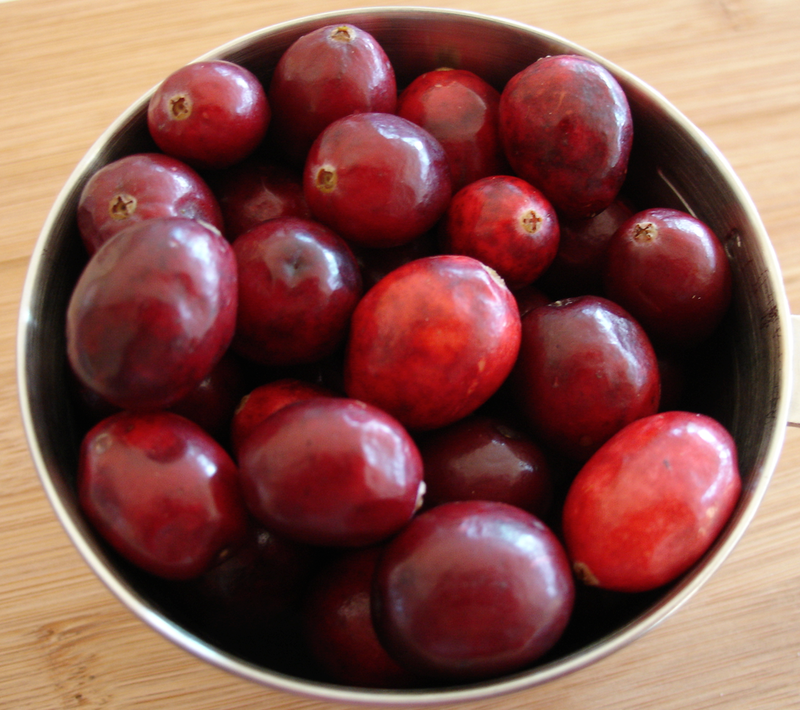 The cranberries aren't any harder than making them for Thanksgiving. And the frosting is easy, too. In addition, this doesn't have to be a marathon. You can make them at different times and put them together when you have an hour. Actually, it didn't take me that long. Make this first because it needs to cool and stiffen some. The original recipe suggests refrigerating it for 8 to 24 hours before using. I followed a helpful comment and popped it into the fridge and then into the freezer for about an hour. That worked fine. Note: I used 1/4 cup of water when I should have used 1/2 tablespoon! It worked okay. 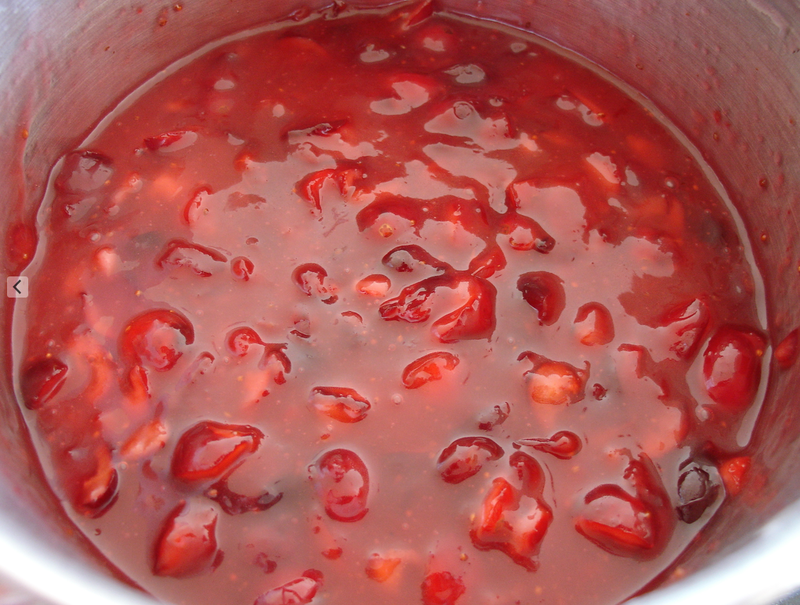 Combine the cranberries and the sugar in a small pot. Mix the cornstarch with the water and stir into the pot. 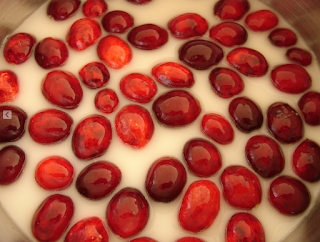 Over medium low heat, cook 4-5 minutes, until the cranberries begin to burst. Cook one more minute, stirring constantly. Add the chopped cranberries and the butter and stir for 1 minute. Remove from heat. Cool on counter briefly, then place in fridge on a towel. When cooler, move to freezer for about 1 hour. Preheat oven to 350. Place cupcake papers in cupcake wells. Mix together flour, baking powder, cinnamon, salt, baking soda, nutmeg, and cloves. Stir well to combine. Set aside. In a two-cup measuring cup (or anything else, but that requires the least cleanup! ), pour 1/2 cup apple cider, 1/4 cup milk, and vinegar. Let stand. Beat the butter with the sugar about 4 minutes. It will turn white and silky. Beat in each egg until well combined. 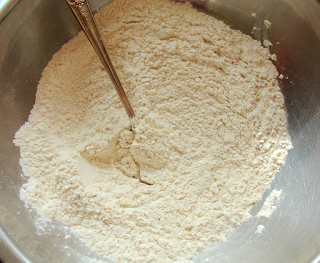 Alternate adding the flour mixture and the apple cider mixture. Add vanilla and beat. Fill cupcake papers half full. Bake 15 minutes or until a cake tester comes out clean. Beat the butter. Reduce speed to low and add the sugar 1 cup at a time. When all the powdered sugar is in, beat on high for at least 3 minutes. Add the vanilla and the cream and beat 1 more minute. Pipe little rosettes around the rim of each cupcake. Fill the center with a small amount of cranberry filling. If desired, pipe a mini Christmas tree in the middle of the cranberries by simply piping smaller and smaller circles as you go up. Bake the cupcakes or buy plain cupcakes. Buy white icing in a can and make the little rosettes. 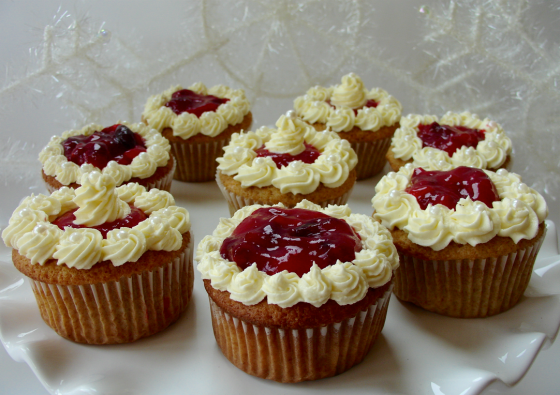 Buy cherry pie filling and use the thick liquid part in the middles of the cupcakes. 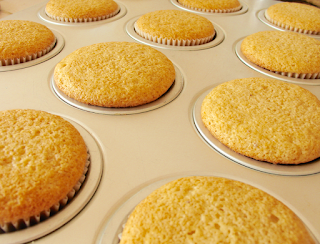 Only fill cupcakes 1/2 full because they rise. 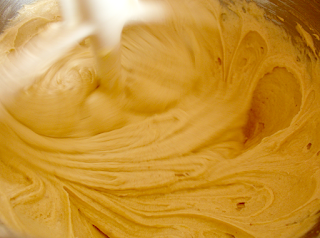 The secret to this frosting is to beat and beat! Can you tell which one doesn't have pearls on it? 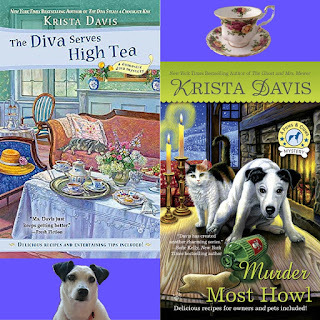 Since it's our holiday recipe week here at Mystery Lovers' Kitchen, I'm giving away a book. Winner's choice of The Diva Serves High Tea or Murder Most Howl! To enter, leave a comment with your email address, please. Good Luck! Happy holidays. What a fantastic recipe. Always looking for something else tomato with cranberries, and I think your tweaks really make it perfect. Thanks! These look delicious can't wait to try them. Thanks for the chance to win. Should we use 1/4 cup or a 1/2 tablespoon of water? I enjoy how you all tweak recipes according to your taste preferences, ingredients availability, etc. That recipe looks very festive---and cranberry is such a traditional Christmas flavor. Thanks for the recipe and the book giveaway. Love the cupcake recipe but I'm honest. 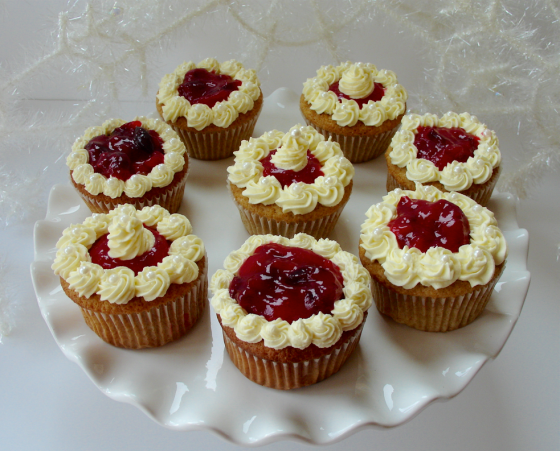 I'm not sure I would make them as I'm the only one that would eat cranberry on them, hubby and family would eat the spice cupcakes with the buttercream icing but turn their noses up to the cranberries. Lol. If I'm chosen I would love The Diva Servers High Tea. Cupcakes look delicious! I love both series. These look delicious & festive. Thanks for the giveaway. This looks good. Thanks for the opportunity. If I win I would like Murder Most Fowl. Very strange. Again, like yesterday, I thought I posted a comment earlier, but I don't see it. I love spice cake! Better than chocolate as far as I'm concerned! Love the recipes!! I'd pick The Dive Serves High Tea. I've already enjoyed the other choice. Thanks so much for the chance! Merry Christmas to all!! Those cupcakes look delicious. Thanks for the chance. Now I want one! Thanks for the giveaway.